This weekend, I had the opportunity to preview three elements of Season of the Force, a new event in Tomorrowland celebrating Star Wars. I had the chance to check out Hyperspace Mountain, the new scenes in Star Tours - The Adventures Continue, and the Star Wars: Path of the Jedi film. Needless to say, this review will feature spoilers, so if you want to stay spoiler-free, click away now. 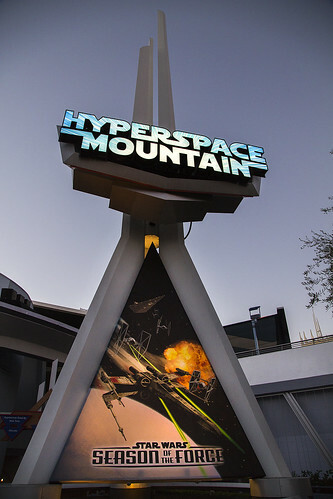 The immediate approach to the Hyperspace Mountain entrance is already a little different, with a new logo and banner promoting Season of the Force. Once you enter the queue, you’ll have no way around seeing a new safety video, which features the infamous Admiral Ackbar describing your mission to you, while Star Wars music plays softly in the background. Of course, the majority of the changes come to the ride experience itself. The ride kicks off as any Star Wars film does, with the blasting main theme. As you enter a dark tunnel, members of the Blue squadron check in and prepare you for the jump to hyperspace, which is cleverly recreated as you head up the main lift hill. But as riders will soon discover, the squadron has been ambushed! It’s a trap! The ride consists of you being chased at by projections of Imperial Star Destroyer and TIE Fighters, while also being blasted at by awesome, convincing laser effects. It all comes to a close as we once again make the jump to hyperspace and return to Space Station 77. Hyperspace Mountain is an incredibly fun experience, although it is a bit uneven. The launch and anticipation is thrilling, but visually, everything falls apart for the first half of the ride. You hear blasts and other things going on, but can’t see anything. It’s not until the second part of the actual ride that things pick up again visually. Fortunately, the good far outweighs the bad, so I can definitely see Hyperspace Mountain being an extremely popular part of this event! As with Hyperspace Mountain, everything appears pretty similar from the approach. In fact, with Star Tours, there are no changes until you’re sitting down in your Starspeeder 1000. After the opening scene (which remains the same), we blast off to a new planet in the Star Wars galaxy, Jakku, which happens to be a desert, very similar to Tatooine. But the scenery here is vastly different. 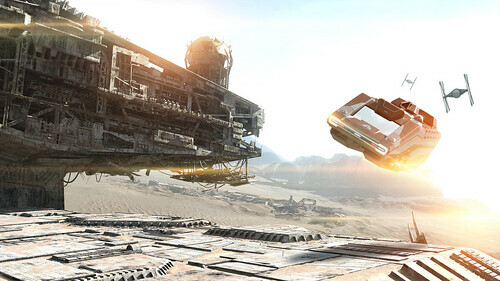 Your Starspeeder blasts in and around a crashed Star Destroyer, while following the Millennium Falcon! One great surprise in this scene is the appearance of John Boyega as his character Finn, from Star Wars: The Force Awakens. The new elements to Star Tours fit in perfectly with what was introduced in 2011. I can’t wait to see it all randomized and see where the journey will take us. I also hope they continue adding planets as the new films come out, as it’s an easy and fun way to keep things fresh! 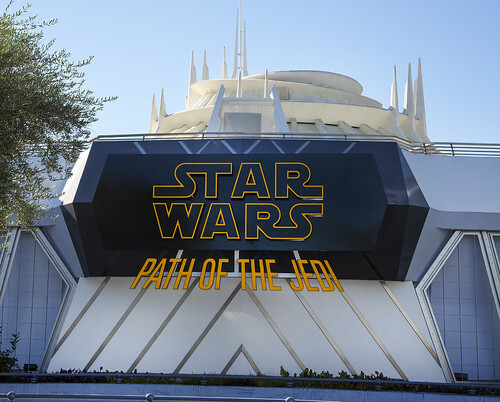 Finally, I got to experience the short clip film, Path of the Jedi, which takes place in the Tomorrowland Theater, the old home of Captain EO. This film basically recaps some of the most important scenes and legends from the first 6 Star Wars films, ending with the main trailer for The Force Awakens. I appreciate the idea here, but the film was kind of weirdly edited. The clips were mainly based around quotes from the film (in random order), instead of trying to recap the story. I suppose if you haven’t seen the films, then you wouldn’t want it spoiled, but I still feel there was a better way to edit this film. Still worth checking out though! And that’s it for Season of the Force for now. We’ll report back to you soon with our opinions from the soon-to-open Star Wars Launch Bay, as well as the Jedi Training: Trial of the Temple show, which opens December 8th!